Mountain Land’s Share The Love Program has been a huge hit since it was first launched in 2014. Since then, the Mountain Land team has referred hundreds of their friends and family members to our therapy services! To qualify as a Share The Love referral, you must submit the information through this page. Each referral you submit must be friends, family or acquaintances in the community that are not already being seen in one of our clinics. By referring your friends and family to our therapy services, everyone wins! 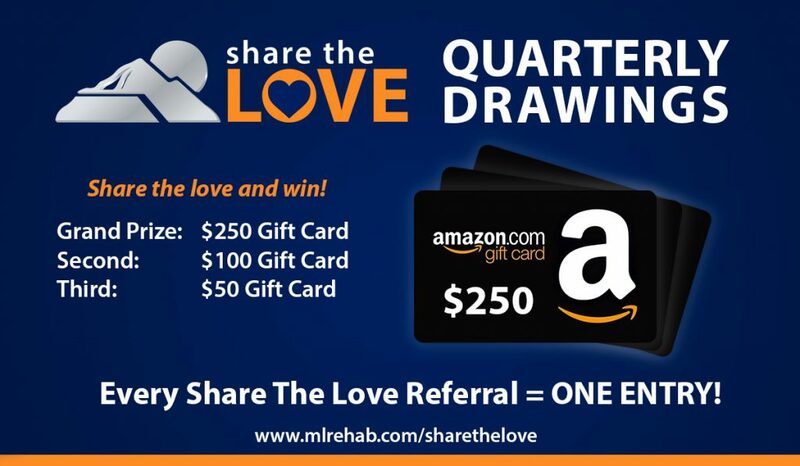 Head over to www.mlrehab.com/sharethelove to get started! When you refer a friend or family member to Mountain Land, enter your information and theirs into the form on this page. We will follow-up with them and make sure they are happy with their experience. Mountain Land Team: Fill out this form each time you refer a friend or family member to be entered in our quarterly drawings! NOTE: Patient must receive medically necessary MLR services (PT, OT) in order to qualify for a referral. Please provide contact information so that the relevant clinic can make contact if necessary. Do they already have an appointment with one of our clinics?